Click on a topic below to go directly to that section. The CBA Website focuses on two sets of processes that will enable you to develop and successfully deliver a construct-based approach (CBA) to implementing comprehensive school counseling programs. The graphic below displays the two sets of processes. The first three processes (Develop) will be discussed in this module. The second set of processes (Deliver) will be discussed in the “Deliver a CBA” module (accessed via the link to “Develop a CBA” in the dark green shaded row in the Navigation Pane at the top of each webpage). A CBA is learner-centered. The “Develop a CBA” module describes why the first set of processes are essential to student learning and achievement, and how they function as primary building blocks for a CBA. This module is intended to provide the information and tools you need to develop a construct-based approach (CBA) that can be integrated into your existing school counseling program with the expected results of improving your counseling program, counselor practice and learner outcomes. The following aspects of the first three processes are critical to understanding their importance to a CBA and how they are related to each other. The processes are learner-centered. They are intended to focus our attention on what is required to help students become proficient learners and achieve excellence through participation in the school counseling program. The processes are sequential. These processes are best understood as a three-step sequential set of activities that build on the successful completion of prior steps. In other words, our ability to complete step two depends of our successful completion of step one, and our ability to successfully complete step three depends on the results produced in step two. The processes are iterative. Initially, completing this first set of developmental processes will help you establish the foundation for your school-specific CBA. The examples, recommendations and tools provided in the “Develop a CBA” module will help you construct your foundation. Due to evolving changes reflected in new research, evidence-based practices, school environments and student needs, however, the results of your initial efforts are not carved in stone. These steps need to be revisited over time to determine how the CBA can be improved and better serve students. The three processes are inextricably related. These processes represent the primary building blocks for developing a CBA. They need to be viewed as a unified process with three parts. They should only be discussed in relation to, and never in isolation from, each other. The “Develop a CBA” module is divided into three major sections: a) “Define Student Excellence,” b) “Develop Meaningful Learning Opportunities,” and c) “Develop Student Assessments.” A brief description of each section is provided below. In addition, webpages containing more in-depth information about each topic can be accessed via the hyperlinks in the Sidebar to your left. It is recommended that you read through this overview in its entirety before moving on to the more detailed webpages in order to gain an understanding of how all these component parts are related to each other. The verb “excel” points to our capacity to achieve beyond minimum expectations. The phrase “student excellence” represents student progress, proficiency and achievement beyond minimum requirements for learning (what students are expected to know and demonstrate). In addition to excellence referring to achievement beyond minimum requirements, it also incorporates the notion of achieving at the highest level of one’s potential. 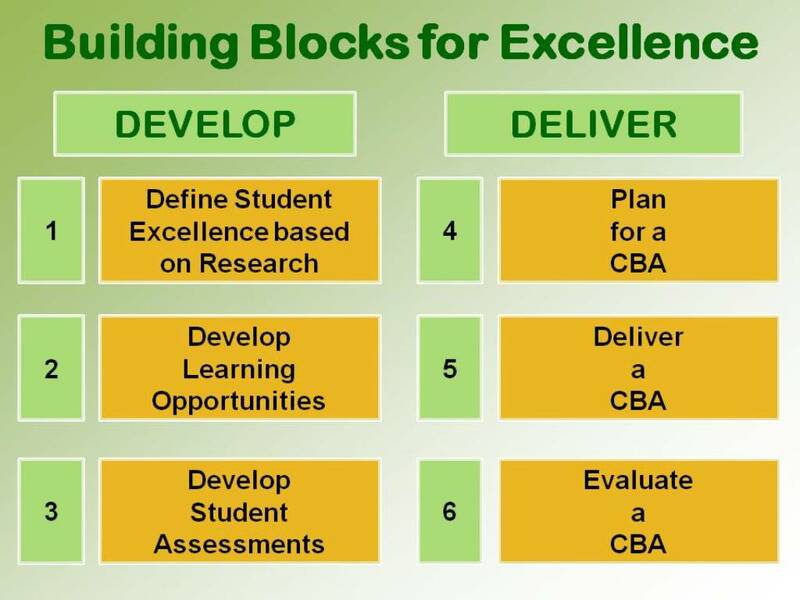 In a CBA, student excellence refers to students achieving the CBA student standards (by the time they graduate) and associated competency-builders) which contribute to their capacity along the PreK-12 learning continuum to achieve the CBA standards. Excellence means that students are able to demonstrate a mastery of relevant knowledge and appropriate skills, and consistently apply and transfer their learning from one context to others. 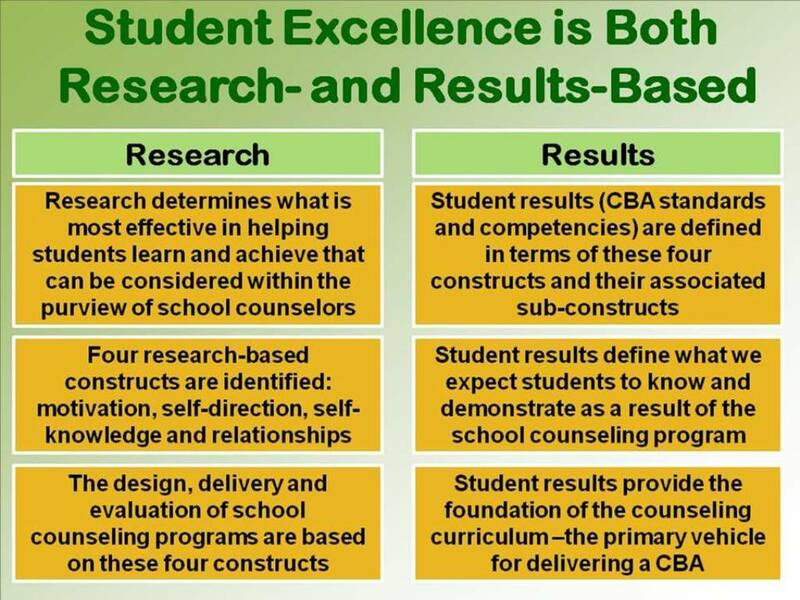 Two aspects of student excellence are critical to understanding a CBA. The first focuses on the important role of research in developing a CBA. The second focuses on defining the results we expect students to achieve through participation in the school counseling program. As has been noted, an extensive review of research on what has the most significant impact on student learning yielded four constructs and associated sub-constructs that are strongly related to student achievement and well-being. The fundamental premise of a CBA is that since research has determined what is most effective in student learning, achievement and well-being in areas that are within the purview of school counselors, that school counseling programs should be designed, delivered and evaluated based on these research findings. If we want to claim that school counseling programs are research-based, which the educational community deems as a required component of high quality educational programs, then it is logical to affirm that high quality school counseling programs should have as their central focus motivation, self-direction, self-knowledge and relationships. A CBA is substantively informed by research findings related to the four CBA constructs. In order to help you learn about research that is relevant to a CBA, we have dedicated separate webpages to each construct and each of their associated sub-constructs. Research is used to define student results: what we expect students to know and demonstrate as a result of participation in the school counseling program. The results are articulated as standard and competency statements. They identify what students are expected to achieve by the time they graduate (standards) and all along the PreK-12 learning continuum (competencies). The CBA proposes 12 standards as the end results of a CBA school counseling program, three standards for each of the four research-based constructs. CBA school counseling student standards and competencies primarily address students’ metacognitive and social-emotional development. School counselors are significant contributors to helping students learn how to learn, plan for their future success, and cope with the many challenges of growing up and being prepared to access and benefit from postsecondary educational and career opportunities of their choice. Once student excellence (the research-based results we want students to achieve through participation in the school counseling program) has been defined, we need a way for students to learn what we expect of them and how they can achieve the results. This brings us to the second step in developing a CBA. To accomplish this, we must provide students with meaningful learning opportunities in which they can learn what is being taught, apply their learning in a variety of authentic contexts, and demonstrate their proficiency and achievement to others. The CBA curriculum is the primary vehicle for delivering a CBA school counseling program. This section discusses how to write meaningful competency statements, develop challenging learning activities, and assess your students’ progress toward CBA standards and competencies. 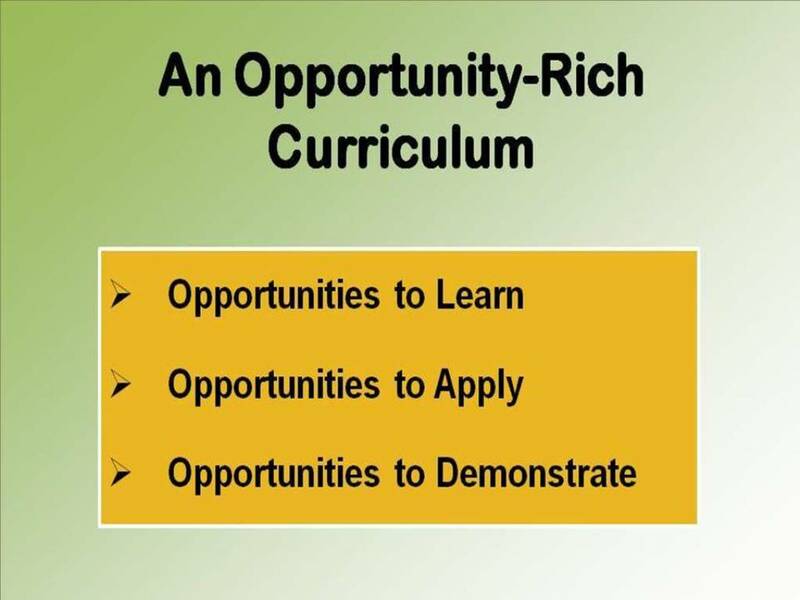 In addition, this section enables you to develop, document and evaluate the quality of your curriculum activities, and create a developmentally-appropriate scope and sequence of core CBA curriculum activities (those deemed so important to student growth and achievement that they are delivered to all students). Learning opportunities delivered as part of a CBA need to be opportunity-rich. Every opportunity should reflect the following features in their design and instructional opportunities. CBA learning opportunities should always provide students with opportunities to learn what we expect of them (standards and competencies) and how to achieve them, opportunities to apply their learning in authentic contexts to render the activity meaningful, and opportunities to demonstrate the extent of their progress and levels of proficiency and achievement. Thus far we have discussed the results we expect students to achieve through participation in the school counseling program and how we help students achieve the results through a challenging school counseling curriculum. Now it is important to be able to determine and report students’ progress and the level of proficiency and attainment each student has achieved. 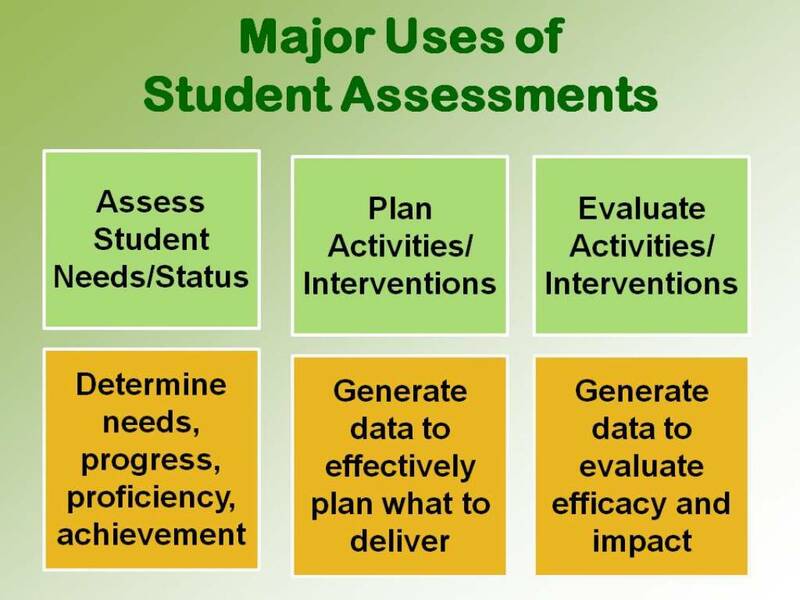 There are many ways to assess students, both individually and collectively. CBA student assessments are designed to determine student progress toward the CBA student standards and competencies. This section will discuss three types of assessments: a) needs assessments that determine students’ learning needs and initial proficiency levels, b) perception surveys that determine how students feel about the school counseling program and its impact, and c) a CBA Student Report Card that assesses and reports students’ metacognitive and social-emotional status. The CBA Report Card is issued as part of, or along with, the school’s academic report card at the end of each reporting period. This section focuses specifically on assessing students. 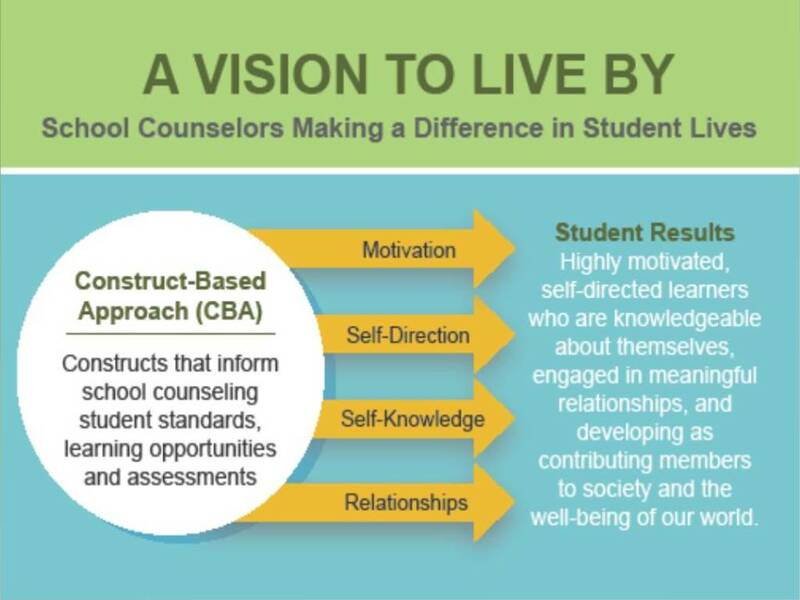 A discussion of how to evaluate the school counseling program and its components is provided in the “Evaluate a CBA” section of the “Deliver a CBA” module. All webpages in the “Develop a CBA” module can be accessed via the hyperlinks in the Sidebar to your left. Each of the three major sections of this module begins with an overview that explains the purpose of the section and how the webpages are organized. Are knowledgeable about the research which informs the CBA. Have identified the standards and core competencies which serve as primary learning targets for students. Have developed a rigorous CBA curriculum that provides students with opportunities to learn, apply what they are learning and demonstrate their proficiency (extent and quality of their learning). Have organized your curriculum activities in a developmentally-appropriate scope and sequence. Have developed ways to assess and report student progress toward CBA standards and competencies. It is now time to turn your attention to each of these three main sections for information and tools that can help you achieve these results. It is recommended that you review the three sections of this module in order as they are initially best understood as sequential processes. Links to all webpages subordinate to the “Develop a CBA” module will appear in the Sidebar of any webpage associated with this module. “PDF” versions of all these webpages can be accessed from within the respective webpage, and in the “Free Resources” module.